Movie actress and American theater, born in Brussels (Belgium) on May 4, 1929 and died in Tolochenaz (Switzerland) on 20 January 1993. His real name was Kathleen Edda van Heemstra Hepburn - Ruston. Daughter of an Irish financial rico and a Dutch Baroness, also with personal fortune, his early years lived in the Netherlands. In 1938, after the divorce of his parents, he/she studied at the Marie Rambert School in London, where it was formed in dance and drama. However, as a result of the outbreak of World War II in 1939, he/she returned to Holland, when he/she began to manifest itself as a discrete ballet dancer. At the end of the war, he/she returned to London where he/she worked as model, facet in which, when he/she was already a world-famous actress, continued to be the source of inspiration for excellence for the Couturier Givenchy. His cinematic beginnings in film dates back to 1948. Three years later already held a short dialog with Alec Guinness in gold bars (1951), Charles Crichton. His rise to fame occurred in 1953: William Wyler was preparing the shooting of vacation in Rome (1953) and proposed the role of female protagonist Jean Simmons, which rejected it. Audrey got it. That comedy, by Gregory Peck, was its irreversible rise to stardom. With its thinness, its elegance and splendid photogenic, as well as some excellent interpretive skills, he/she would become one of the artists most wanted by the public around the world for many years. The following year came the premiere of Sabrina (1954), where her innocence and candor captured to a veteran and cynical Humphrey Bogart and where Billy Wilder showed that, if there was a God, at least it was a great film director. Two years later he/she shot war and peace (1956), of King Vidor, where represented Natacha. The film, excellent adaptation of the famous Leo Tolstoyclassic, was made with great dignity, despite the difficulties that transpose such text to the screen entailed. Breakfast with diamonds (1961), a Blake Edwardscomedy, was a film that would leave a deep imprint on many viewers for its mix of comedy and drama. The script was due to the excellent pen of the writer Truman Capote and, beside the actress, began its takeoff a player like George Peppard. Charade (1963), Stanleydonen, was a fun movie, with a structure of mystery, with a mature Cary Grantfilm. It was well received, but Grant, when he/she was on screen realized that his career as galan was coming to its end. Too old to fall in love with girls, could not continue to give the type of role that made him famous, which decided to withdraw the film. George Cukor, a man of special finesse for the actresses - and who is said that it was the true leader of what the wind shadow (1939) - selected it for one of the most delicious interpretations that could aspire to an actress. Audrey was already 35 years old, but his frailty made her appear less mature. In 1964, was the delicious star of My Fair Lady, where the incomparable Cecil Beaton, as artistic director, won an Oscar, among others by how dressed the actress for the film. In 1954, Audrey married the actor of Spanish origin Mel Ferrer, who had worked in two movies in that decade. The marriage lasted until November 21, 1968, in which the divorce occurred. Fruit of their union was the birth of his son Sean. Later, in 1969, on January 18, he/she married the doctor Andrea Dotti, which in 1970 had her son Luca Andrea. He/She divorced in 1976. In 1967, and after acting in alone in the dark, where he/she was a blind stalked by a criminal, with the direction of Terence Young, decided to withdraw the film. After nine years of absence, he/she returned to the screens when Richard Lester called it to Robin and Marian (1976). The movie was filmed in Spain and is an excellent view of the myth of Robin Hood. Lester, one of the most emblematic of the 1960s English directors and seventies, took the two characters when already the time had been depriving them of youth and passion. Now two mature beings, they were on the brink of old age. Audrey was 46 years old and Sean Connery, who was Robin, was a wonderful actor who wanted to move away from it the wake of James Bond. Ironic, bitter and with a point of tragedy, was an excellent film, not too much valued. The rest of his film career was not as important. Although he/she acted with directors like Steven Spielbergor Peter Bogdanovich , he/she worked in more than twenty films throughout his life. But, despite this, it got some signs of distinction and identity film as few actresses of her generation and the subsequent film history. Among the prizes won throughout his career, figure the coveted Oscar for his work on holiday in Rome, his first major role. He/She was nominated four other times. In 1958 he/she won the award for best actress for the Film Festival of San Sebastián (Spain). Since 1988 he/she devoted himself to humanitarian work. Appointed Ambassador of Unicef, as such, toured Africa and America, concerned about the situation of the most disadvantaged. Diagnosed with colon cancer, the last twelve years of her life he/she lived them romantically linked to Robert Wolders. 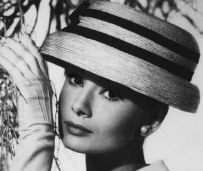 Audrey Hepburn was a woman of modern beauty, fine sensibility and special talent to communicate with the public, one of the best representatives of the sophisticated comedy. Eleven years after his death, his humanitarian efforts on behalf of needy children had not been forgotten. His son, Sean Hepburn Ferrer, produced an album titled All children in school with a 48-page booklet with previously unpublished photographs of the actress in her duties as Ambassador of Unicef, whose benefits would be for the programme of the Organisation for literacy and education of more than 120 million children in the developing countries. The album helped renowned performers, including Susheela Raman, Teresa Salgueiro (vocalist of the group Madredeus), Caetano Veloso, Dulce Pontes, Omara Portuondo, or Ani di Franco. 1948: Nederlands in Zeben Lesen. 1951: Young Wife completo Tale; One Wild Oat; Laughter in paradise; Americans in Monte Carlo; Gold in bars. 1952: Secret People. 1953: Roman holiday. 1954: Sabrina.1956: war and peace. 1957: A face with angel; Arianne.1959: History of a nun; Green mansions. 1960: those who do not forgive. 1961: Breakfast with diamonds; The slander. 1963: meeting in Paris; Charada.1964: My Fair Lady. 1966: Two on the road; How to steal a million and...1967: Alone in the dark. 1976: Robin and Marian. 1979: Blood ties. 1981: Everyone laughed. 1986: Directed by William Wyler. 1989: Always, forever. Works for television: 1957: Mayerling (episode of Producers' Showcase). 1987: Love Among Thieves.